A repeat of Rachael's appearance on Oprah will be airing tomorrow. It originally aired on November 23, 2005. This is a great episode, too. 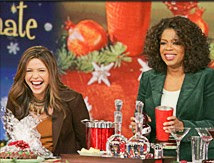 It's the one where Rachael helps one of Oprah's producers throw a Christmas party. Then Oprah surprises the producer's guests by showing up to the party to help out! Click here to find out when the show will be on in your neck of the woods. Neat. Question, when--if ever--will Oprah's "Favorite Things" show be on? I swear it usually airs in November or earlier so we have enough time to go out and buy all of Oprah's stuff. Right? Did she really just give out $1,000 giftcards to the audience (that they had to give away) and that's it? Jacob - lucky for you I have an encyclopedic knowledge of celebrity news. I read at this blog that there's no Favorite Things show. You are right - she did the giftcard thingy instead. Boooooo! I got all of the recipes from this “Christmas Party” show, but I have moved twice since then and can’t find them anymore. Luckily, I was able to find the 5 minute fudge recipe because I could remember the name of it. I have not been able to find the other recipes since I cannot remember their names. I definitely remember an excellent alcoholic drink was served! Does anyone know where I can find these recipes? I want to use them this Christmas! Please, HELP ME! Thank you in advance.